Supreme Warrior is a Full Motion Video (FMV) game that was also released on the Sega 32X-CD in 1994. Your mission is to carry a magical mask from the Shaolin temple to a secret sanctuary in order to stop Fang Tu from using its powers for evil. Along the way, you'll face 12 opponents that have unique abilities and fighting styles. 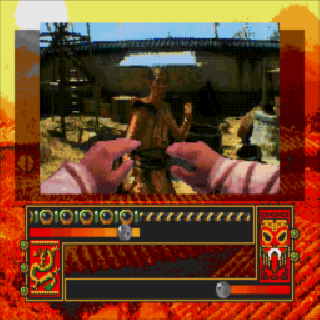 The action uses a first-person perspective and while the FMV plays you can block and look for openings to strike; this includes punching, kicking, and learning secret moves and special skills (such as temporary invincibility) after defeating foes. In some ways, the game resembles Punch-Out!! (1990, NES) in that each opponent has a specific weakness you need to exploit; however, the combat here is clunky. For starters, you can only attack when an icon pops up, but these only appear on the edge of the screen and by the time you've gazed away to look at them you've already been punched in the face. Another problem is that there's barely any differentiation between these punch and kick icons from a design standpoint, forcing you to waste precious time deciphering them before attacking. On top of this, there are many occasions where the game doesn't register your inputs (despite you hitting the correct button at the correct time) and blocking only works infrequently. The FMV isn't full screen and while that isn't an issue, the heavy video compression results in glitchy audio and a low frame-rate, affecting your block timing. The enemies are infuriatingly relentless from the get-go, and to make matters worse their health regenerates when they move away from you; this is totally unfair considering you have no control over the FMV and spatial distance! Supreme Warrior is the kind of 'game' you'll swiftly want to wipe from your memory, as its broken combat system and punishing difficulty make for a completely miserable experience. The core gameplay is barely playable, and without that, you're basically left with a ton of grainy, badly acted and poor quality FMV. Random trivia: A version was planned for the Sega Saturn, but was ultimately cancelled.